I couldn’t help wondering what the shoals of young college students who trooped into the Lyric last night were making of this latest version of Chekhov’s classic about innocence defiled, Art and ambition. Sure, Simon Stephens’ version makes no bones about how an obsession for fame can lead to ruin, hell and damnation or all three. Adelayo Adedayo’s Nina is burning to be a `celebrity’, idolising Nicholas Gleaves’ driven novelist, Boris – `I write all the time, I can’t stop. What is so brilliant or sparkling about a life lived like that. It’s cruel’ – but destined to be ruined by him. And there must have been moments when Chekhov/Stephens’ lines about the hopelessness of human beings and their infatuations (delivered with a delightfully resigned touch by Hugo, Paul Higgins’ country doctor) and Lesley Sharp’s wonderfully characterised portrait of self absorption, Irina, must have struck home. The Seagull is nothing if not another sad tragic-comic distillation of human folly and disaster when it comes to love and emotional attachment. They must also have related strongly to its two young souls, Nina and Konstantin, about to be crushed by their elders by casual cruelty on the one hand and self-regard on the other. 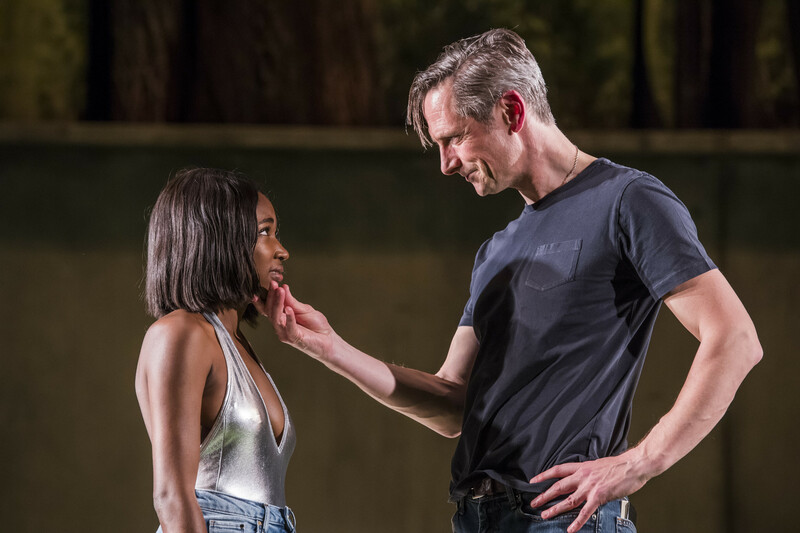 But in Sean Holmes’ modern, updated production, there are large acres of undramatic lacunae, when the production seems to come to a full-stop – as indeed other productions of Chekhov have also appeared to do. Chekhov, despite his classic status, is not an easy one to get right. His microscopic observation of the rural society around him in Russia at the end of the 19th century, the unhappy lives of the inhabitants of its estates and their retainers, their boredom, penury, hopeless love affairs, requires very particular rhythms. You can either choose to emphasise the dullness, the tedium with pacing that draws the sad laughter out – as the Russians do, accentuating the tragic-farce – or you can take it a rattle, as Katie Mitchell did recently with her electric, galvanised and modernised version at the Young Vic of The Cherry Orchard. 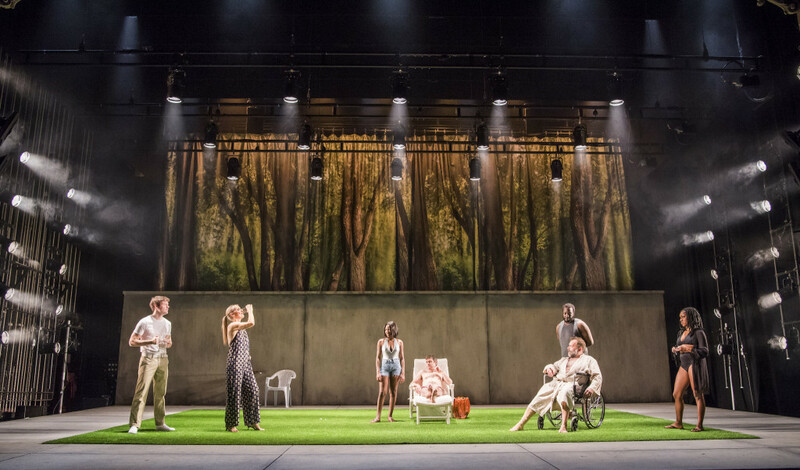 For his Seagull, Holmes goes for the former, in a today’s equivalent set in a minimalist landscape, dominated in Act One by huge flashing lights trees and later on a backdrop of woods. By the final act, we’re in what looks like a plastic covered lean-to. Has the estate so gone to seed it’s only covering is now plastic sheeting? There are other odd choices – a good deal of direct addressing of the audience and a lack of clarity causing a certain amount of confusion as to who is who or related to who. 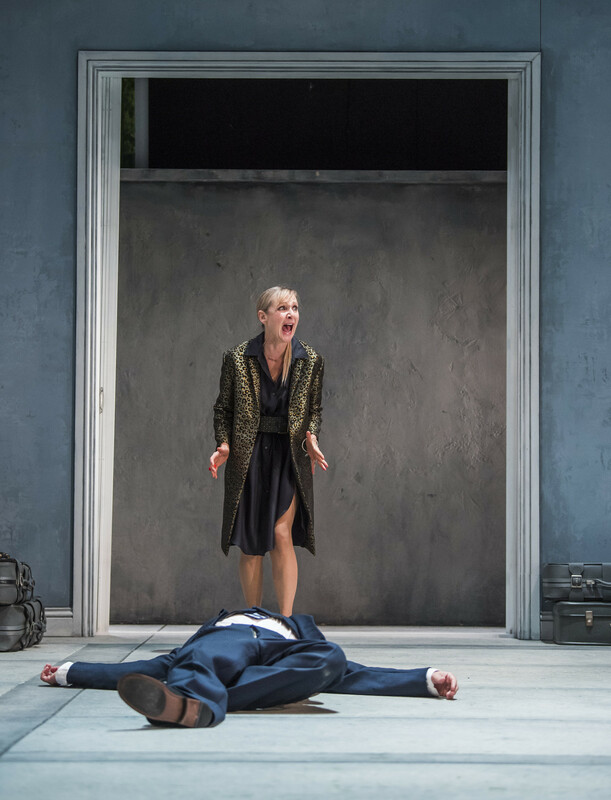 The glory of the production is undoubtedly Lesley Sharp’s Irina. Fluttering her arms, goading one moment, breaking into self-pitying tears the next, she absolutely catches the waywardness, the narcissism of some actors and makes her re-appropriation of Boris, her lover, in the throes of intoxication for Nina, an act of pure survival: brutal, sexual, triumphant. Holmes’ also succeeds well in highlighting keynote moments with segments of Vivaldi’s The Seasons adding a note of false brio to a play that exudes passion about theatre and writing as vital art forms but which, I suspect, in this production, fails to convey it enough to its present day audience for them to feel Nina and Konstantin’s tragedy as intensely as we should. 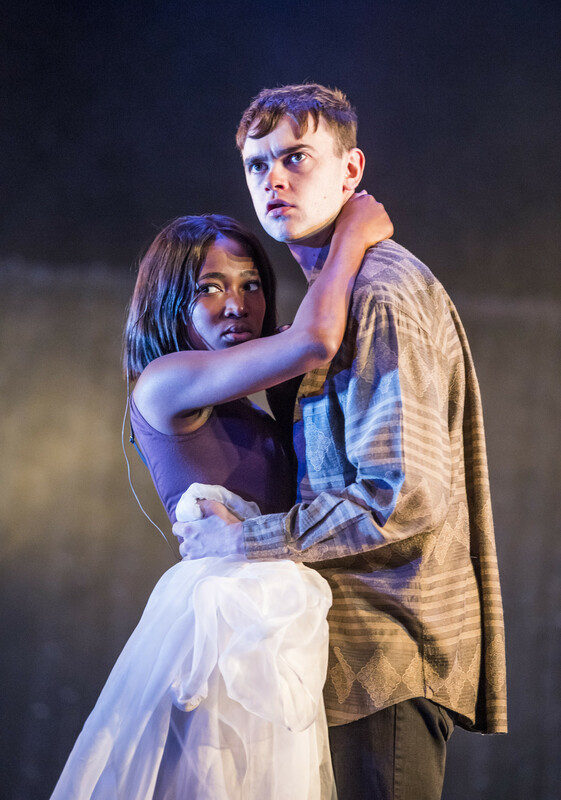 © Tristram Kenton, Adelayo Adadayo as Nina, Nicholas Gleaves as careless with lives novelist, Boris. Konstantin, after all, is the voice of the future, a radical voice crying in the wilderness but psychologically a young man, offspring of a famous woman, desperately in need of love and care. Irina has failed to give him either. Nina in her own way, too, has been crushed by negligence and the casual cruelty of Boris. Adelayo Adedayo and Brian Vernel’s young lovers give us plausible outlines without, again, quite capturing the tortuous inner pain both are experiencing. Good but not, yet, quite gelling. First perf of this production of The Seagull, Oct 3, 2017. Runs to Nov 4, 2017.